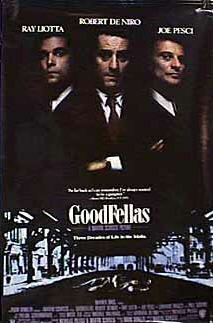 I was watching Goodfellas the other day and realized, that I have seen this movie at the very least, 50 times. I love it, it’s a classic! From the actors to the script to the director, there is not one thing that I don’t love about this movie. It’s one of those movies, I can watch over and over again and never get tired of it. I remember a time when I lived in my own place and didn’t have cable and a very limited movie supply, I watched Goodfellas everyday for a week straight. We all have movies like that, that in some way touch us or evoke some type of reaction, whether it makes us laugh, cry, root for the hero or in some cases, cheer for the bad guys. I have several and some are classics and some are, well to put it kindly, are probably not topping any AFI lists anytime soon. Some of my favorites that I can watch over and over again besides Goodfellas are The Princess Bride, BDS, Auntie Mame and Heavenly Creatures to name a few. So I’m just curious, what are some of your “Go to” movies, the movies you can watch repeatedly and still get excited to watch? There are currently 3 Comments on Ready, Set, Go!. Perhaps you would like to add one of your own? Lars-I have to say, I do love the Departed besides it’s a Scorcese film, the cast is awesome, I’m a huge Matt Damon fan, its definitely not Goodfellas but still a great film. Kellie- I loved Tombstone and Die Hard is action perfection, how awesome is Willis in that movie. I do love Buffy, not a huge fan of Angel till Spike came in, I just couldn’t get into it without him. There were quite a few films I could have listed but didn’t want to bore everybody with my lists. Oh yes Willis was awesome just love him! Also Val & Kurt in Tombstone:) Spike is my fav character too he could have had his own show… I love movie lists you wouldn’t have bored me. So good. I am anxiously awaiting the day I can sit with my 16 year old and watch it. Might do a double feature with Scarface, but he is probably a year away from both. Only downside to watching Goodfellas is I get angry all over again that The Departed won the Oscar – doesn’t even crack Scorsese’s top 10. Movie Vine / News / Ready, Set, Go!